The uniquely named town of Kennebunkport Maine didn't get that cool name until 1821. Though the exact date of the earliest settlement in the area now known as Kennebunkport Maine is uncertain, historical evidence indicates that it cannot have been much later than that of the founding of the Plymouth Colony. It is known that for many years prior to the first permanent habitation, the islands along the Cape Porpoise shore were used for fish drying and as a summer headquarters by those who came to tap the rich resources of the coastal fishing banks. In 1653, the town was first incorporated as Cape "Porpus" and became subject to the government of Massachusetts. 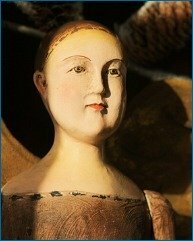 Entirely depopulated by Indian depredations in 1689, the town was resettled early in the 1700's and renamed Arundel by permission of the Massachusetts General Court in 1719. 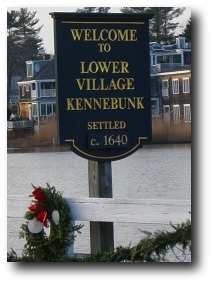 This designation remained until 1821, when, having become a bustling port of entry for foreign trade, with a custom house, the town was given its present name of Kennebunkport. 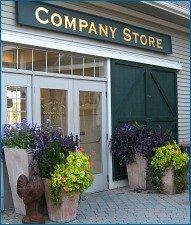 Whether your Kennebunkport vacation allows for only a brief peek at the towns' story or a more in-depth examination, a stop at the town of Kennebunkport History Center will prove rewarding. All exhibits are free; although donations are always welcome. By car, there are two direct ways to visit Kennebunkport; the Maine Turnpike (toll road) or Route 1. [--] Route 1 North will bring you to the same place as the Turnpike - Kennebunk center - where you'll bear right onto Route 35 and head right into Kennebunkport. Me, I usually take Route 1 unless I'm in a hurry or want to avoid summer weekend traffic. I enjoy driving through Ogunquit, Wells and Moody, 'cause some of my favorite Maine restaurants, antiques, and shops are along the way. 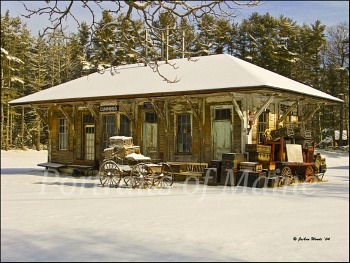 Yup, there's plenty to look at when you meander up Route 1 to Kennebunkport - like this beautiful old train station pictured above, just sitting by the side of the road. If you choose the Maine Turnpike from York, it's about 20 minutes north to Kennebunk Exit 25. A short trip into Kennebunk center, and straight through the center to Kennebunkport on Route 35. Got your dog in the car on your Kennebunkport travel day? Make a pit stop at the Kennebunk dog park so your dog will be happily tired while you shop and dine in the 'Port! Check the map above: it's on Sea Road off of Route 35 - my pooch loves the Kennebunk dog park...yours will too. SUMMER ONLY: If you don't feel like concerning yourself with traffic or parking, consider taking the Shoreline Explorer trolley system. 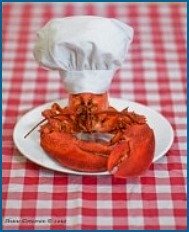 You're in Kennebunkport Maine - Now What? 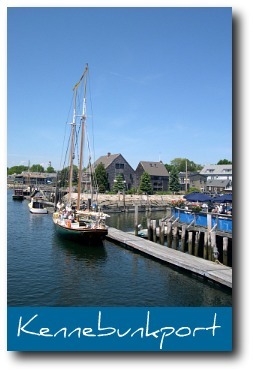 Dock Square and the Lower Village along the Kennebunk river are the hub of Kennebunkport. Bursting with shops, terrific restaurants and fine art galleries, most of the buildings in Dock Square and the Lower Village are from the days when it was a small New England fishing village in the 1700's. The wide, pine-planked floors creak, the shop staircases are narrow and crooked, and the back streets twist and turn every which way. The hardworking lobstermen of Kennebunkport Maine still set out to sea from this spot, and every December during Christmas Prelude week, Santa arrives by lobster boat. Now, most people think of the town of Kennebunkport Maine as a fine summer tourist destination - and it is. But for those of us who are here year round, Christmas is a treasured time of year, particularly here in one of "America's Top 10 Christmas Towns", as Kennebunkport was designated by Home & Garden TV (see video below). If it's summer and you've been walking and need to get off your feet for awhile, enjoy the windjammer cruises, whale watches or lobster boat cruises that leave out of Dock Square. 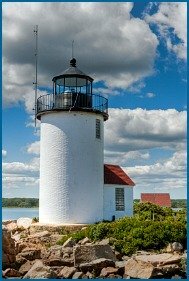 Check out these and more Kennebunkport attractions and fun things to do in town and in nearby Cape Porpoise. Does seasickness keep you on land? Do what I do - go sit outside at Federal Jack's Restaurant & Brew Pub overlooking the harbor and hoist a mug of cold beer at your friends heading out on the ocean - it's a "brew with a fine view"! 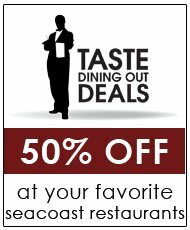 Need some ideas on dining in Kennebunkport restaurants? While you're sure to find new favorites of your own, Alisson's is loved by tourists and locals alike, and the Hurricane - I just adore the Hurricane. It's so cozy, especially the bar! Grissini's has some great Italian food, and Windows on the Water is perched on high overlooking the river and harbor. Of course, the ocean view from the Cape Arundel Inn can't be beat, and the gourmet White Barn Inn is a special occasion dining destination for romance or any type of celebration. Whenever we're on Ocean Avenue near the Colony Hotel in Kennebunkport, we make it a point to stay for lunch or dinner (the Colony is closed during the winter months). At the Colony Hotel, Kennebunkport has not only a premier oceanfront resort, but a great place to enjoy either an elegant meal in a gorgeous oceanfront dining room, or have something a little more casual in the Lounge. Whichever we choose, dining there is a nice way to enjoy the Colony without necessarily staying at the Colony! You can do the exact same thing at the Nonantum Resort on Ocean Avenue. Like the Colony Hotel, the Nonantum is also seasonal. Spend a day or a two in Kennebunkport, Maine - any time of year, you'll be glad you did.